The history of the village Grötzingen began long before it was first mentioned in the year 991, as it appears under the name "Grezzingen" in possession of a document of the monastery Weissenburg in Alsace. Of finds from the Roman times to the Grötzinger art colony and the changes shown in photos of the last decades the rich themes of the 39 panels of the beginning of this historic tour. Many traces of the past few days have been lost over the centuries and still can take a walk to rediscover some of the old conditions. The big tour that takes you through the historic areas of the town, gives a brief overview of the life of Grötzinger farmers, the courtly influences and the preserved old places. However, even with a smaller walk allow you the panels 1-5 and 29-39, to put himself in the time of the former farming village. 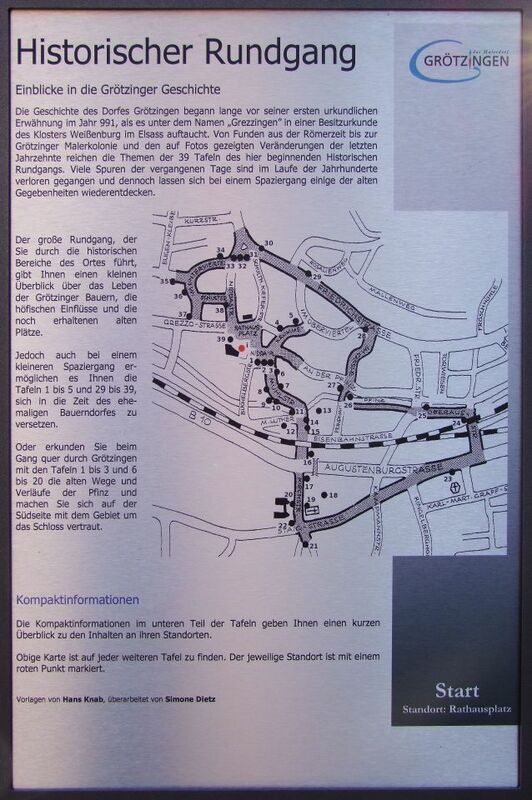 Or explore while walking across Grötzingen with the tables 1-3 and 6-20 the old ways and patterns of Pfinz and participate on the south side with the territory familiar to the castle. The compact information at the bottom of the panels will give you a brief overview of the content to their sites. The map above is found on any other board. The particular location is marked with a red dot.